This HiRISE image ( PSP_003253_1880 ) shows a pedestal crater located in a geologic unit on Mars called the Medusa Fossae Formation. Pedestal craters are produced by differential erosion around impact craters. If the ejecta (material thrown out of the crater) is more resistant to erosion, then the crater and surrounding ejecta will be preserved while the surface is eroded nearby. This causes the ejecta blanket surrounding the crater to form a "pedestal," standing out in relief rather than gradually merging into its surroundings. There appear to be at least two resistant layers in the material around this pedestal crater, as there are two "steps" in the topography of the pedestal. The cutout, from the long ridge near the top center of the image, shows these steps as well as possible smaller-scale layering. 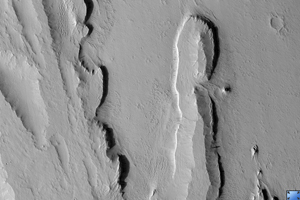 Despite the detail resolved by HiRISE, it is not clear why the step-forming layers are more resistant. Much of the scene is coated with a mantle of dust which obscures details. 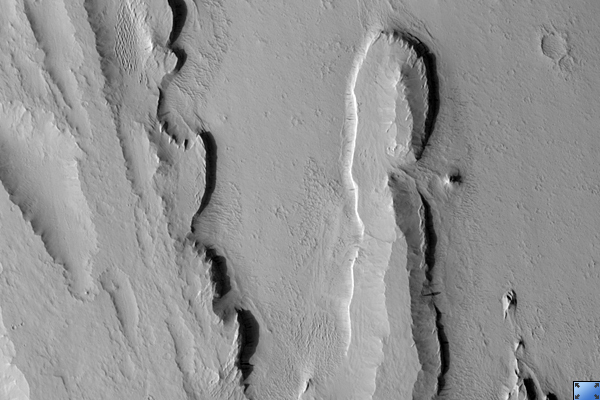 Dark slope streaks, likely produced by small avalanches in the dust, are common here. Dust deposition and erosion are also likely the reason for the scalloped texture of mantling material in the crater.